nothing is crisp, everything the same shade of white. you assume gravity is in check, that you’re standing upright. on split second analyses of angles and shapes. but all you truly know is where earth pushes up more. you might as well ski with eyes closed, you realize. speed and direction would be impossible to gauge. tumbling in an inner ear tempest, empty of sound. beckons you to the edge of the world, in blinding light. 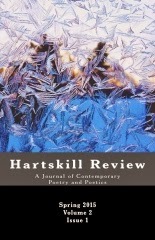 first published in Hartskill Review: A Journal of Contemporary Poetry and Poetics. Vol. 2, Issue 1. Ed. Joshua Hjalmer Lind. Eau Claire: ThrewLine Books, 2015. 4. Print.